I haven’t had time to do as many post recently as I would like as I have been going crazy trying to find a job, any job will do really! In a little over a month now I will be returning home to England, I guess permanently for now, and leaving ship life behind for a life on land, hopefully filled with growning vegetables in my garden and visiting forests, the thing I miss most while living on water! Well so far no luck… Lincolnshire is not calling out for vegan chefs unfortunately so I am having to look at very different career ideas, something I haven’t had to do for years now and its pretty daunting, and extremely stressful. The dream is to open a vegan cafe/restaurant in Lincoln, something it desperately needs, but I am a very very long way from having saved enough funds to get that up and running, so I am spending my days trawling the interent for jobs to apply for that are not completely soulless and I can feel I am still doing some good in the world. But that means less time having fun making new creations in the galley unfortunately. 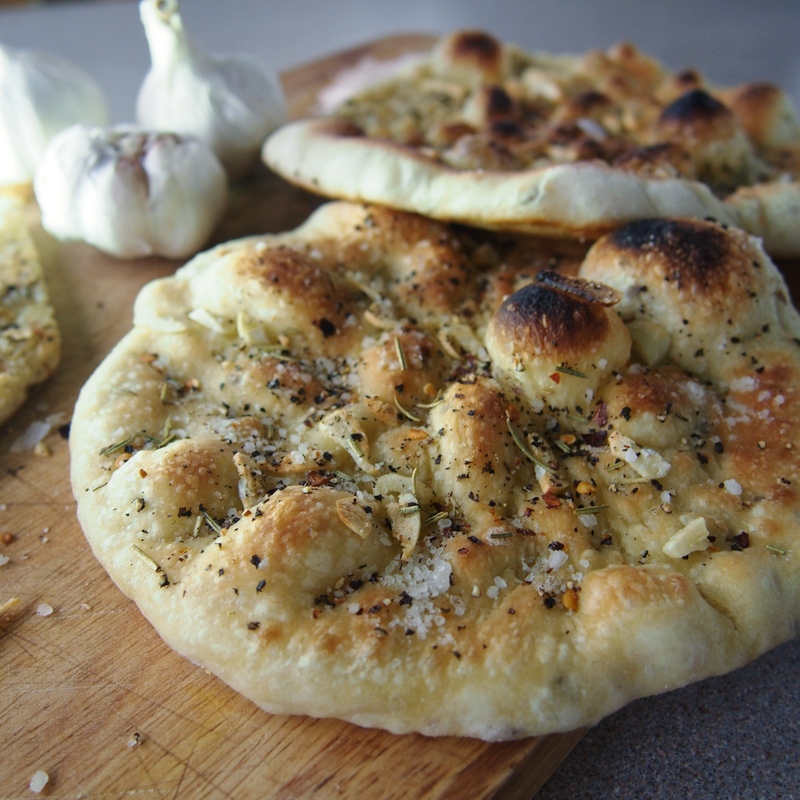 This is just a quick recipe I wanted to share for our now ship favourite garlic breads. This recipe came about when I had some leftover pizza dough last week and just quickly chopped up some garlic and throw it on top to make a little extra for lunch. I had no idea it would turn out so awesome …we then preceeded to have garlic bread that afternoon, with dinner, and at some time during the day for the next four days. I even taught one crew member to make it for himself once I leave the ship. What I like most about this recipe is the rise time… it barely exists, so perfect for when your short on time. I make the dough, let sit for 10 minutes, prep the rest of the ingredients and then its ready to roll out and use. For this recipe I like to keep the topping pretty simple, but why not try throwing on some fresh olives, fresh herbs or thinly sliced onions. Combine the flour, flaxseeds, salt, sugar and instant yeast in a large mixing bowl. Drizzle on the 1 Tbsp of olive oil, then using a wooden spoon mix in 1 cup of water. Stir to form a dough and if it seems to dry add up to 3 Tbsp more water bit by bit. The dough should come together enough so you can turn it out on a floured surface and knead for 4 minutes. The dough needs to be very soft and easy to knead but not sticky. If sticky add a little flour as you knead, and if it is tough to knead and dry add more water. Its all about the feel of the dough and the amount of water can vary depending on the brand of flour used. Cover the dough and leave to rise for 10 minutes, then start the prepare and chop up the garlic. Divide the dough into 5-6 piece and smooth and roll into balls. One at a time roll out, either by stretching and pushing with your hands or using a rolling pin, to approximatly 8 inch rounds. Heat a large skillet or frying pan on a medium to high heat, no oil, and at the same time turn your broiler on to heat up. 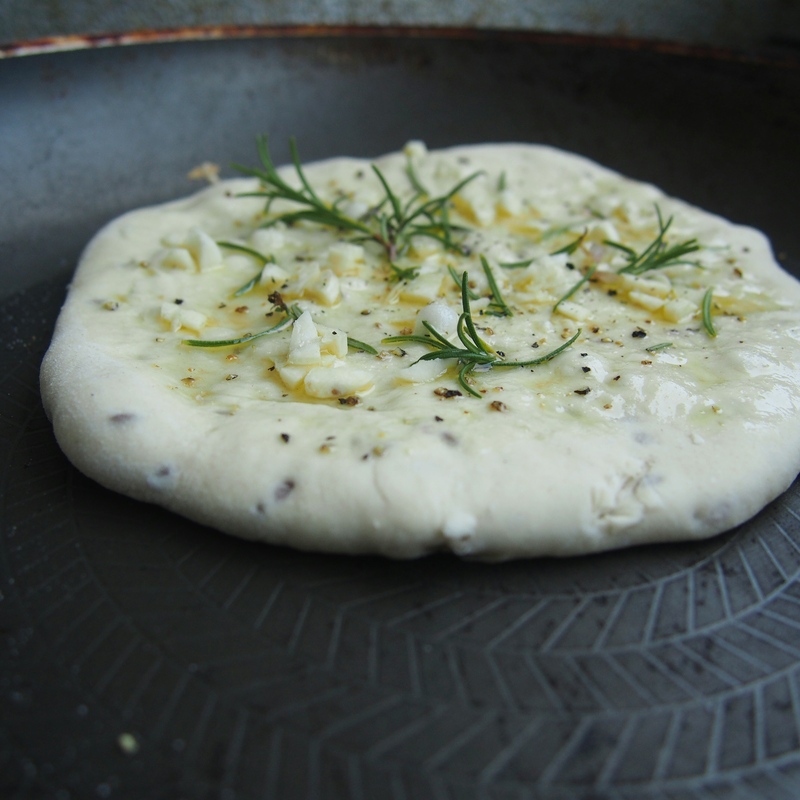 Place one of the rolled out doughs in the skillet, drizzle about 2 tsp olive oil and spread evenly with the back of a spoon, evenly distribute about 2 of the chopped garlic cloves and season to taste. After about 5 minutes (keep checking), the bottom should be browned and cooked, kind of like a stone baked pizza effect. Once the base is dark brown, remove from skillet and place on the rack below the brolier, about 3 inches from the heat source. Keep and eye on it and cook until golden with a few dark crispy patches. What kind of flour would you us to make this gluten free? Have you ever tried it with all whole wheat flour, or a portion of it? This is my kinda bread recipe, fast and garlicky! Nothing beats a good classic garlic bread. This looks delicious! !